The hot spring to commemorate Mr.Shimamura, baseball supervisor of Meiji Univ. Takamori-machi is next to Iida-shi, southern part of Nagano-ken. It is well- known as the apple and the firefly. 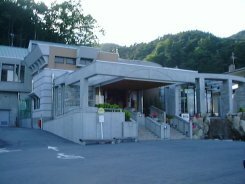 There is town-run hot spring facility at Yugahora hot spring. 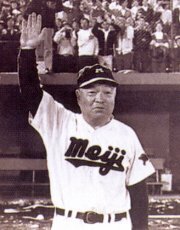 Ontai means boss and indicates Mr. Yoshiro Shimaoka, ex-supervisor of The hot spring facility was made in memory of his achievements. You can see Ina area along with Tenryu-river and the mountain senery of south Alps from the open-air bath. The remembrance of Mr. Shimamura are exhibited in the lobby. You get off at Matsukawa IC of Chuo highway. You turn right at the signaland you go to prefectural road Route 15. You turn right at signboard of Matsukawa country club as your guide and passe under the Chuo highwaynce. You climb a slope and go to "Harmonic road". You go straight on this road from there. About 15 minutes from Matsukawa IC. The parking lot is large.